Virtual Contact Lenses is tiny, full-colored displays that Digital images can be projected onto to better situational awareness in intelligence, surveillance. And a contact lens that allows virtual graphics to be seamlessly overlaid on the real world could provide a compelling augmented reality experience. 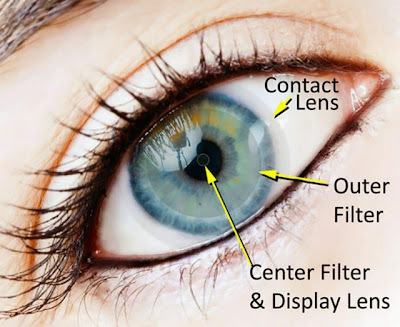 The lenses function is a special set of polarizing filters which separate high intensity display light and an internal magnifying lens that focuses the light into a single narrow beam. 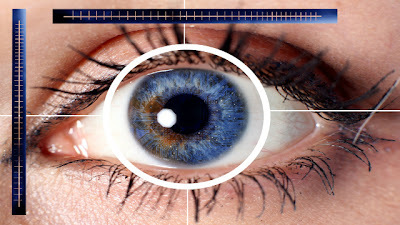 The effect is that each set of light rays is transferred independently to the Retina, permitting users to simultaneously focus on far away and close up visuals, in a full field of view. A contact lens contains a single LED pixel, a custom made integrated circuit and an antenna. And it offers the first real potential for immersive virtual reality. And also contain full color mega pixel displays which can project a virtual 3D world over your eyes, or supplement your existing surroundings with augmented reality.